Our number one priority at Roomful Express Furniture is to build customer loyalty and earn repeat business. We, therefore, regularly look at every point of contact a customer might have with our organization and evaluate ways we can make it better, easier, or more valuable for our customers. The economics of running a retail business in a non-growth region requires us to find new ways of servicing and exciting our existing customer base. This task is as important for the operations side of our business as it is for sales and marketing. After a sale has been completed and the delivery made, there are additional opportunities to create or lose customer loyalty. Such is the case when the customer calls us and requests service on their furniture. 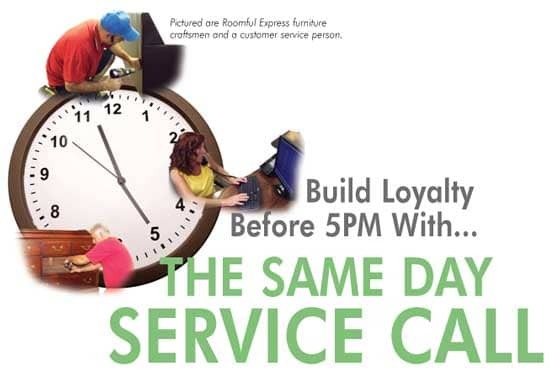 The Same Day Service Program is the newest customer loyalty-building program at Roomful Express Furniture. When customers who need service contact our call center, we offer them the option of having a craftsman come to their home THAT DAY, at no cost to them. Although it seems counter intuitive, this program actually provides an operational cost savings while boosting customer satisfaction! Even with the additional service expense, this program has generated a cost savings to the company by providing a 20% reduction in exchanges. Dan Bolger, in his September 2007 article “Delivery Survey 2007”, published in FURNITURE WORLD Magazine, stated that, “An exchange costs five times the original delivery cost and frequently exceeds the margin on any given order. Returns and cancellations can devastate your bottom line because you lose the sales revenue but incur logistics costs for the initial delivery, return costs and the wrath of the unhappy customer who looks elsewhere. In the worst case scenario, the product is damaged along the way and has to be scrapped.” We completely agree with this statement. Most importantly, this program has had a measurable positive impact on customer satisfaction and loyalty. However, getting to this position wasn’t easy. The company had to change its way of thinking about service, costs, and operations. We also had to educate our customers about the value they would be gaining by utilizing our crafting services. Before the Same Day Service Program was instituted, when a customer called in to report, for example, a split sofa seam, our customer support representatives would have an exchange delivered to the customer’s home within 3 or 4 days. This addressed the fact that customers didn’t want to wait the week it took to have a technician come out to fix their problem. The exchange was faster, but turned out to be a more costly option. For that reason, we insisted that our service company provide us with service that was no more than 48 hours out in our core business area. That challenge eventually led to our Same Day Service Program. As part of the new program, we found that we needed to address a frequent objection expressed by customers whose new furniture needed service. Many felt that they wanted new furniture, not “used” furniture that had been repaired. Customers needed to be convinced that they would actually be getting more value out of the service call then they would from an exchange. Therefore, in-house customer service representatives were taught that service team members are professionally trained, furniture builders and craftsmen, with years of experience. These craftsmen do not repair furniture. They “deluxe”, “correct”, and “upgrade” furniture. They add value to the furniture. They are able to make the furniture “better than new”. This repackaging of repair people as craftspeople was not merely verbal sleight of hand. Our service company put on a detailed presentation of their skills for the team. Broken and damaged furniture was put on display, and some of our representatives inflicted even more damage. They were shown the tools and materials they use to restore furniture. They then spoke about the different scenarios they run into at our customers’ homes. This visual presentation did more to change our representatives’ opinions about service than anything else. At the end of the presentation they truly believed the “deluxed” furniture looked better than new! They were now ready to convey that information to our customers with confidence. There are two key reasons why customers ask us for an exchange to begin with. First, furniture that we receive from our suppliers is shipped at “industry standard” and is deemed “commercially acceptable for resale”. Unfortunately, many of our customers expect furniture that is much more than “commercially acceptable for resale”. This often leads to a request for an exchange. Second, the showroom experience is much different from what our customers’ see in their homes. The quality of lighting and accessories, the size of the display area, and arrangement of the furniture can skew their perception of what to expect from purchased furniture. During the delivery, or soon after, customers may find fault with delivered furniture because it doesn’t quite look, work, or feel the same as it did in the showroom environment. This also leads to the request for an exchange. A craftsman can solve both of these issues. At Roomful Express Furniture we call it “deluxing”. Our craftsman can take a manufactured furniture piece and make it look or work a little bit better than it did right from the assembly line. Key selling point: an experienced craftsman can often add value to your furniture and make it “better than new”. We found that many companies have decided against the idea of same day service because they only looked at the initial cost of the service order without fully analyzing the true cost of exchanging furniture. Yes, it costs more to send a craftsman out on a same day service call, however, the true cost of a product exchange is much higher than we originally thought. The new program also creates a good deal of customer goodwill by resolving the problem that day and saving their time. In our company the only person involved in completing the service call is the craftsman. Yet, as stated by Dan Bolger in his article there are many more “logistical costs” that come from reworking exchanged furniture. Our initial evaluation of same day service cost vs. exchange cost showed that processing an exchange costs much more than completing a same day service call. Our company measures both the number of exchanges and their retail dollar value. After 2 months of being on this program our same month (2007 vs. 2008) exchange number decreased by 20%. Knowing the actual reduction in exchanges is important, but even more crucial is the cost savings. There are other benefits as well. For instance, fewer exchanges result in lower fuel surcharges billed by our delivery company. First time service completion rates are up, and with fewer returns coming into our distribution center, productivity is much higher. Most importantly, our customers are happier. The customer satisfaction scores show that. The same day service program has become one of the most important “after sale” loyalty building tools we have used. Mike Bowman began working with Roomful Express Furniture (owned by R.H. Kuhn Company) in 2004 as Customer Support Manager. In 2007 Mike was promoted to Director of Customer Support overseeing the call center / customer support offices, repair, and delivery operations of Roomful Express Furniture and Home Store East (Ashley Home Store). In his current position with R.H. Kuhn Company Mike focuses on business initiatives that build customer loyalty, including programs that measure and control delivery effectiveness, first time answer rates, first time repair completion rates, and the quality of customer interactions. Recently, he managed the startup of the company’s same day repair service operation, mystery caller program, and the training and development of representatives, craftsmen and delivery personnel to create positive customer experiences.